Our 24 gauge spiral pipe has a minimum of G60 thick protective coating of galvanized steel, perfect for all your small ducting needs. Available in easy to ship and install 5-foot lengths when you need small quantities. Spiral pipes and fittings along with our flexible hoses will complete your piping system. Spiral pipe is commonly used in dust collection as well as other applications such as industrial ventilation, spray booth stacking, welding booths, paper trim, pharmaceutical clean rooms, etc. 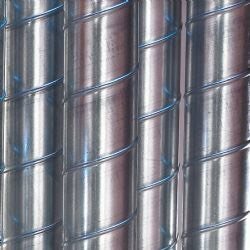 Spiral Pipe 24 Gauge Galvanized (3”-5”) has a minimum of G60 thick protective coating of galvanized steel, perfect for all your small ducting needs. Spiral Pipe 24 Gauge Galvanized available in easy to ship and install 5-foot lengths when you need small quantities. Spiral Pipe 24 Gauge and fittings along with our flexible hoses will complete your piping system. Spiral pipe also available 22 gauge, 20 gauge and 18 gauge galvanized steel along with stainless steel. Our 22-gauge spiral pipe is commonly used for dust collection, fume collection and HVAC and has a minimum of a G60 thick protective coating of galvanized steel. Spiral pipe is up to 20% stronger than smooth pipe systems of the same gauge, due to the added spiral reinforcement in the manufacturing process. Make sure you have the right gauge for the right job. Do not be undersold, just to save money. Our spiral pipe is fabricated to industrial standards, in many cases, 22-gauge is 20% thicker in comparison to the other competitors. Available in easy to ship and install 5-foot lengths. Also available in length of 10-foot when you require longer runs. Our 20-gauge spiral pipe is used for various commercial and industrial applications. 20-gauge spiral pipe has a minimum of a G60 thick protective coating of galvanized steel. Call or fax us your request for quote. Allow 4 to 10 working days for fabrication. Our 18-gauge spiral pipe has a minimum of a G60 thick protective coating of galvanized steel, and is available for your heavy-duty industrial needs. Used for all larger systems requiring the ultimate in strength and abrasion resistance. 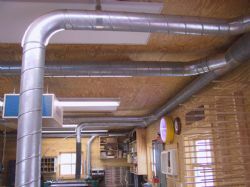 Ideal where high vacuum is required in dust collection systems. Meets requirement for spray booth stacking for 18” or larger according to NFPA standards. Call or fax us your request for quote. Angle Rings are needed to secure connections between 18-gauge pipe sections. Allow 4 to 10 working days for fabrication.